The Puma Darts Youth Summer Camp will take place for the first time in 2012. It was initiated by the Shanghai Xu Hui Regional Government und takes place in Shanghai. Darts is considered in China as a prolific sport. In around 20 schools there exist darts programs and the pupils are coached by special darts coaches. As one can read some of the youth show already outstanding performances. The Darts Youth Camp in Shanghai is another building block to spur the development. Beside talented Chinese youth players some international players were invited. But they will not only play darts, it's a cultural exchange as well. Beside some Chinese experts American Scotty Burnett, Australian youth coach Betty Hislop and Michael Te Moananui from New Zealand will be the coaches. Most international players come from New Zealand and Australia but one European and a Canadian player were invited as well. Global Darts will accompany the young Canadian on his way to Shanghai and during his stay in the Youth Camp. Ron lives in Canada and is an enthusiastic darts player. But he not only plays darts himself - he is very much dedicated to promote youth darts. He already founded several youth leagues and organised tournaments. When he needs prices for the tournaments he usually can rely on the support of friends, acquaintances and dart fans. Ron's son Steven started to play darts when he was around 9 years old though it was not only his father who's to blame for it but John Part as well. Ron had organised some exhibitions with John and Steve was so fascinated that he decided he would one day be a dart players as well and at least as good as John. Thanks to his father's involvement into youth darts Steven had a lot of opportunities to take part in competition and he often won. 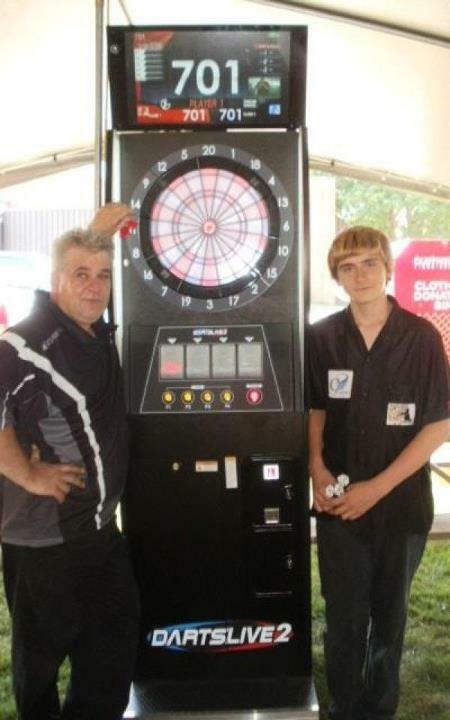 He even managed to take part in some of the PDC events in Canada though he's not yet 15 years old. Since 2011 Steve is sponsored by Cosmo Darts. In July 2012 an invitation to take part in the Puma Youth Darts Summer Camp in Shanghai was waved into Steven's home and the family started to flap. What a chance for Steven!!! But how to manage it that Steven really could take part? All costs in China were payed by the organiser but Ron would have to pay for the flight - around 3000 Canadian Dollar. And could one really let fly Steven all on his own from Toronto to Shanghai??? It was impossible for the parents to accompany him - it just would be too expensive. So Ron once again asked for support - this time to act for himself or better Steven and there were a lot of donations. Smaller ones and bigger ones and it soon was clear the money needed would really be there. Steven could accept the invitation and the family started to look after the official issues and pondered what to do about the " travelling alone". In the end Ron had a brilliant idea - it was not only Steven who had to travel from North America to Shanghai, there was the coach Scotty Burnett as well. Perhaps it would be possible to arrange something with him? But Burnett lives far away from Canada in California. Finally a reasonable solution turned up - Steve would fly alone from Toronto to San Francisco where Scotty would wait for him. They would meet and together fly on to Shanghai!